The twenty ninth album by Status Quo. That's quite a claim in its own right! Back in 1968 they issued their first LP, 'Picturesque Matchstickable Messages From The Status Quo' and built themselves up into one of the top rock bands in the country. A string of classic albums in the seventies made them a household name, before line-up changes and musical differences saw the band split in the early eighties. Next thing you know, they make a comeback in 1986 with the hit 'In The Army Now' and have been steadily touring and recording ever since. Personally, I rated 2002's 'Heavy Traffic' as one of the very best Quo albums, but the follow ups 'The Party Ain't Over Yet' and the amusingly titled 'In Search Of The Fourth Chord' were also extremely high calibre. Since '...Fourth Chord' came out, founder member Francis Rossi made a new solo album and toured with it, releasing a live show on CD and DVD which was highlighted in my interview with him last issue. 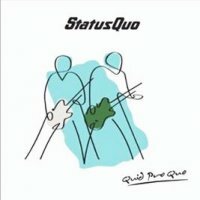 Now it's all focus back on Quo for their new opus 'Quid Pro Quo' - and once again the bar is set rather high. The new album offers fourteen brand new tracks, which sounds a lot on paper, but the truth is the album passes by very quickly indeed. Opener 'Two Way Traffic' is fantastic, one of the best Quo songs I've heard for a long time. It reminds me of the classic seventies style, the sort of track that got the original line up nicknamed 'The Frantic Four'. 'Rock And Roll And You' follows up with infectious charm, and this has been receiving a lot more radio play than usual - you can sample it on our cover CD* this month. 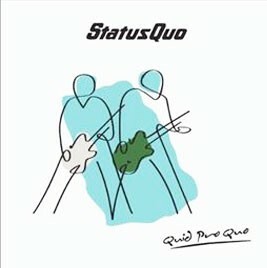 What separates this from previous recent Quo records is the lack of an out and out ballad. Whereas '...Fourth Chord' had 'Tongue Tied', this album is pretty much all up tempo. Sure, there are lighter moments - the Parfitt sung 'Leave A Little Light On' and the groovy 'Any Way You Like It' certainly aren't heads down Quo rockers, but they are still energetic and fun. There are also some more hook laden foot tappers like Rossi's 'The Winner' and 'Better Than That'. The album is available exclusively in Tescos across the UK, similar to the deals many bands have done in America with Walmart. If an excellent album wasn't enough to tempt you, and believe me, it's great, there is a bonus track (the 2010 re-recording of 'In The Army Now' which was done for the Help For Heroes Charity) and a full bonus disk of live stuff, featuring most of the biggest hits. I think this is a great album, and the line-up of Rossi, Parfitt, Andrew Bown, Matt Letley and John 'Rhino' Edwards have rarely, if ever, captured such energy on a studio album. Much like 'Rock Til You Drop' won back Quo fans from their more pop period in the eighties, I think any Quo fan of old who spots this in Tescos would be pleasantly surprised if they added this to their shopping basket. Existing fans, like myself, will already be delighted with it! Cannot wait to get this album! !